The Dyson AM07 is one of the leading ventilators with innovative and patented technology. All the characteristics were considerably improved from the precursor AM02. 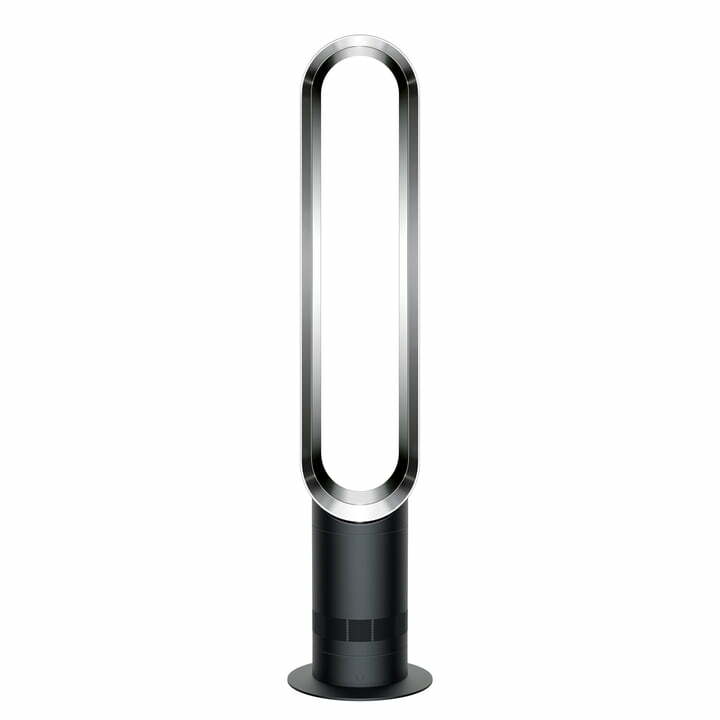 The Tower Fan AM07 by Dyson works with air multiplier technology, which suctions air and reinforces it – without rotor blades. The innovative fan has a slim and linear form, which only requires very little space. The AM07 is 60 % quieter compared to the precursor AM02 and it is more energy efficient, made possible by an aerodynamically optimised interior form of the ring. Common fans with rotor blades create a sudden, irregular air stream, since they cut the air with their blades. The air multiplier technology reinforces the primary air stream. This enables a balanced, pleasant air stream – without any interruptions. Up to 500 litres of air circulate every second thanks to the patented air multiplier technology in the AM07. The air velocity of 3 metres per second guarantees effective air cooling. And this is how the air multiplier technology works: The air is accelerated through a small slot in the air ring of the ventilator. This is how a ring-like air stream grows. It is led across an inclined surface, which is shaped like a wing in order to channel the direction of the air beam. Contrasting to common fans, the Dyson Tower Fan AM07 has no fast rotating ventilator wheel that has to be protected through a grid. This makes the fan safe, also for children. The lack of a grid is also practical when it comes to cleaning: it can simply be wiped clean with a damp cloth. The strength of the air stream of the air multiplier AM07 can be adjusted with two steps. The motor without charcoal brushes is furthermore absolutely energy efficient. The air beam of the Tower Fan is adjustable, since the ring moves up to 70° with a button. 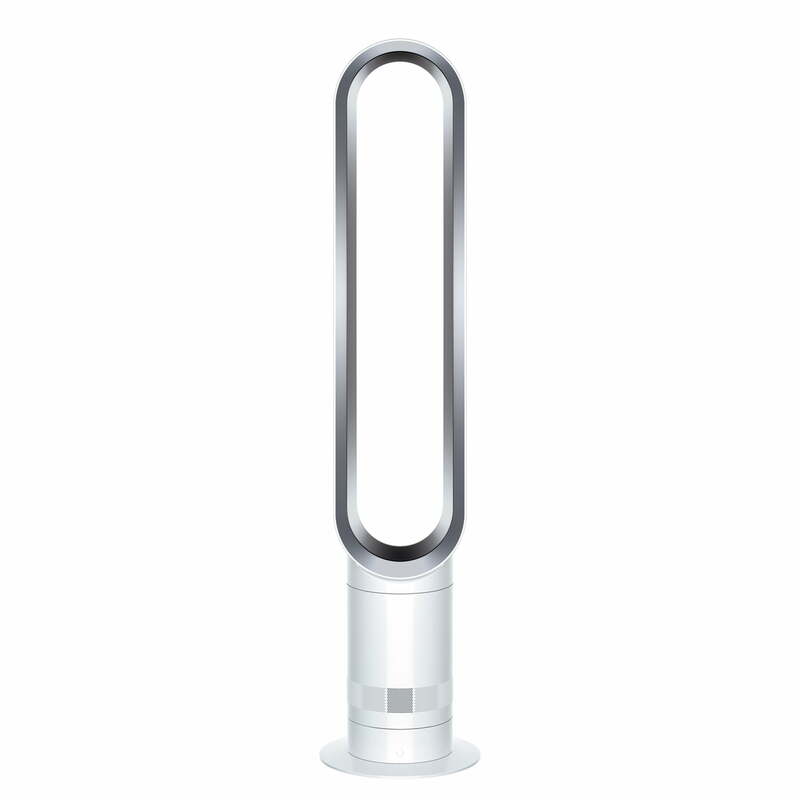 The Dyson Tower Fan AM07 comes with a remote control to switch it on or off from everywhere in the room. Moreover, you can adjust the air’s intensity as well as its direction. The remote control also has magnets so that you will be able to fix it directly on the device so you can always find it. A timer completes the comfort and the safety, since you will be able to adjust the time when AM07 should switch itself off from 15 minutes to 9 hours. Air circulation (max.) 500 litres / sec. Air velocity 3.0 metres / sec. Dyson displays the ventilator’s benefits in great detail: a constant air stream, adjustable angle and no sharp rotor blades. The special guest: A balloon is the main character in this video. The Dyson fan does not mince words. The elegant design of the Dyson fan incites enthusiasm not only visually, but it is also very safe, because there are no more rotating fan blades. This also makes cleaning pleasantly simple. The stylish design of the Dyson fan can be integrated subtly into any living area. This way, you can leave it wherever you like. Thanks to the remote control, operation from a distance becomes child’s play. The intensity of air, the rotation and the timer can easily be set using the remote control.